Erlinda Gonzales-Berry, department chair of the Department of Ethnic Studies at Oregon State University, is at the forefront of scholarship concerning Latino histories in Oregon. She is recognized for her contributions to expanding the body of knowledge about the diversity of Latino communities in Oregon. In 2006, she won a Chatauqua grant from the Oregon Council for the Humanities to lecture on “Sojourners, Settlers, and New Immigrants: Mexicanos in Oregon.” In an effort to raise awareness about Latino issues, she has delivered the lecture at numerous public venues statewide – at libraries, churches and community centers. Recently, she was appointed to the Oregon Commission on Hispanic Affairs, a group that implements economic, social, legal, and political equality for Hispanics in Oregon. The Commission monitors existing programs and legislation to ensure that the needs of Hispanics in Oregon are met. “It’s a wonderful avenue to connect with the community, to be able to take my skills and talents and put them at the service of the community. My goal is to advocate for Latino issues, particularly, the rights of immigrants,” she said. Dr. Gonzales-Berry discusses her scholarship and commitment to Latino issues in a recent interview with Colors of Influence. Through public lectures, what is the one thing that you’d like to impart with your audience? Latinos are here, and we’re here to stay. We have to find ways to integrate new immigrants into society, allow them to keep facets of their culture that they find useful, but also to give them opportunities to become productive citizens. We will never do that if we don’t educate their children. We will never do that if we don’t create access to universities for those kids that don’t have papers. We’ll never do that if we’re xenophobic. What is the importance of scholarship on Latino issues? I’ve always done scholarship and research on the Latino population in the U.S. When I came here 10 years ago, I found this wonderful population, and very little has been written about their histories. I started becoming more interested in doing more research and learning more about the population. There has been little research about Latinos in Oregon, because there have not been scholars in this region who are interested in the subject matter. Fields of ethnic studies tend to expand because of interest from scholars from those communities. 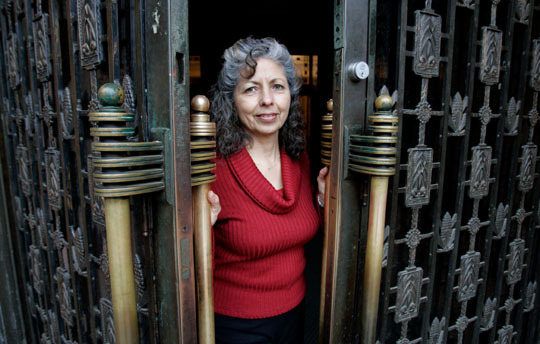 There have been few faculty members of color in Oregon school, particularly Latino scholars. Now, because of interest in immigration and immigration studies, we see more people starting to work in the area. I’ve interview about 75 people from different places in Oregon who have come from Mexico. As I learned more, I thought it would be great to do this presentation publicly for people. I do an overview of the presence of Mexicanos, because people tend to think it’s all new immigration, when really it goes back a long time. In addition to the historical review, I also talk about contemporary issues. What spurred your decision to embark on an academic career? My mother was a teacher. She was my teacher in a rural school in New Mexico, from 5 th through 8 th grade. I had a great role model, and it was always pretty clear that I would become a teacher. I went to college, and became a public school teacher. Then I decided to go back to school. I started studying Spanish and got my master’s degree. I really loved the subject matter, so decided to pursue a Ph.D. I was in school in the early 1970s, when social and political movements abound, and the new field of Chicano literature was blossoming. My dissertation focused on the literature of Chicanos in the U.S., as well as cultural issues. I became more interested in New Mexico histories, people and culture. When I came here, it was natural for me to focus my scholarship on the Latinos in this region. What brought you to Oregon? I came on board OSU in 1997 as the first permanent chair to establish an Ethnic Studies Department at OSU. We’re the only such department in state university in Oregon. Prior, I was Chair of the Department of Spanish and Portuguese in the University of New Mexico. Before the Ethnic Studies Department was formed, OSU was by-and-large a very white institution. In the early 1990s, there was an incident involving an African-American student who was walking past a fraternity, and someone up on the balcony urinated on him. This created a big issue on campus. There were demonstrations. People came together, wanting to change the climate in the institution, by ramping up recruitment of students of color and other inclusion programs. It was also determined that, at the time, existing programs and departments at OSU were not teaching subject matter related to traditional underrepresented minority groups in this country. The administration determined that the institution needed a department to accomplish that. The idea was to build a small department that would focus on the histories and experiences and cultures of four major racialized ethnic groups in this country: Native-Americans, Asian-Americans, African-Americans, Chicanos/Latinos. It was designed to be small and would probably stay small. Part of its mission is to incorporate teaching of subject matter into the curriculum and to also serve as a magnet for attracting students of color and to also encourage other departments to hire faculty of color. A big part of our job is to link OSU to serve as a liaison between the university and communities of color in Oregon. How has the department been successful in accomplishing its goals? Every faculty member is charged with building a curriculum, and be engaged in our communities and work with all the student groups on campus. We have about 35 or so majors, but more than 1,200 students annually take courses offered through the department. Majority of our majors and students are Caucasian students, so it attracts students across the board. We were able to integrate into the university system, so we’re not a marginalized group in any sense of the word. We’re central to the mission of the university. The first class enrolled some 18 students. The administration estimated that by the fifth year, we would enroll 500 students. In fact, by the fifth year, we enrolled some 1,000 students. We grew fast. People were eager to have us on campus. We had tremendous support – top-down – from the administration, and laterally from colleagues and students. Of course, there were some people that didn’t want us there. They felt that other departments could teach the subject matter. They fought us, and stood by to watch us fall flat on our face. And I think they were surprised that we prevailed. Looking back to your contributions to scholarship, what are you most proud of? I’m proud of the fact that I exerted leadership in building a department that is respected in our institution, very integrated into the institution. We offer an excellent educational program, and we’ve made a difference on our campus in terms of making OSU welcoming to people of color. When presenting the history of Mexicanos and contemporary issues, what are the most important takeaways for mainstream audiences? Many people are surprised at how long Latinos have been here in Oregon. They’re surprised at what the history has been, and how Mexicanos have been able to establish communities and create a place for themselves. More contemporarily – what I try to help people understand is that immigration is created by political and economic global forces. Because our nation has been so involved in the process of creating immigration, we need to assume responsibility for what we’ve created. There is a rich history of Mexicanos in Oregon. It’s important for people to have an informed understanding of immigration as a process that is much more complex than the sound bites we hear on television. You’ve studied Chicano histories in New Mexico and in Oregon. What are some of the major differences and similarities between these communities? People of Mexican origin have established themselves in New Mexico there as early as 1598. We have a longstanding population, and that population was conquered and colonized by the U.S. in 1848. Our experiences have been very different, because we didn’t come here as immigrants. We entered the nation as colonized people. Our struggle has been different, because it has been that of colonized people. We know that we’re rooted in that place, so our struggles have always grown out of our need to defend our homeland and our position within it. The fact that we do have a homeland there is what has given us the strength to struggle against colonizing forces. We’re much longer established, and our people have been able to enter into mainstream institutions in the early 20 th century: there are lots of professionals, doctors, lawyers, professors, and teachers. We’ve had government officials in Washington D.C. in the early 1900s, and have had at least four Chicano governors. In New Mexico, we have new immigrants who have settled over the last 20 years or so. There are conflicts between immigrants and established peoples. In Oregon, the community is made up of early settlers and new immigrants. There were early settlers too, but their history only goes back to the mid-1900s. That was when people started coming from Texas and settling here. What do you enjoy the most about the work you do? I’m passionate about the educational enterprise. I’ve been doing it for 35 years and I love learning and sharing knowledge. At OSU, I’ve organized conferences on Latinas that were held in the community. I worked with students and community leaders to put together the conferences at Woodburn and Independence high schools. We addressed issues of domestic violence, affirmative action, young women and sexuality, and more. On campus, I organized a symposium about Mexicanos in Oregon. I pulled together university professors, students and community leaders to sit together on panels to explore their history. I’ve always only been in university settings. I’m coming upon the end of my career – I’ll be retiring pretty soon. I want to really get involved in community work. The Oregon Council for the Humanities public lecture series is my first step toward figuring out how to connect with communities and how I can continue to educate beyond an institutional setting. "There is a rich history of Mexicanos in Oregon. It’s important for people to have an informed understanding of immigration as a process that is much more complex than the sound bites we hear on television." "Many people are surprised at how long Latinos have been here in Oregon. They’re surprised at what the history has been, and how Mexicanos have been able to establish communities and create a place for themselves."